Not all of the 1600+ people who attended DATE 2013 earlier this year in Grenoble were able to fit into the room where the panel celebrating 30+ years of the Mead-Conway VLSI Revolution took place. Those who could, however, were treated to a lively 90 minutes of conversation on what that revolution meant to the world of electronics and chip design. Organized by Synopsys’ Marco Casale-Rossi and moderated by U.C. Berkeley’s Alberto Sangiovanni-Vincentelli, panelists included Berkeley’s Jan Rabaey, IMEC’s Hugo de Man, CMP’s Bernard Courtois, Columbia University’s Luca Carloni, and Synopsys’ Antun Domic. Although I was among those disappointed to have missed the event, I was able to speak after the fact with Antun Domic. He described the ambiance of the SRO session in Grenoble and enumerated several of the points laid out by the panelists, starting with their praise of Lynn Conway and Carver Mead’s ground breaking text book, published in 1980, Introduction to VLSI Systems. Per Antun, “First of all, the panelists in Grenoble all made acknowledgment of the importance of the book, including a number of things that came out of it that were very influential in the industry. For example, the simplification of the layout rules enabled designers [to work] without advance knowledge of what fab the design would go to. “Eventually that ability was translated into the concept of a foundry. You could do a design knowing [the implementation] was going to be solved by UMC or TSMC, and so on, or even dual-sourced. This attempt to decouple design from manufacturing through a very well-defined interface [proved to be] very successful and enabled a lot of design, even inside of IBM. The first impact [of Mead-Conway] took this decoupling, and the understanding of the interfaces between design and manufacturing, and become extremely influential. Several additional outcomes of the Mead-Conway VLSI Revolution, according to Antun, were noted by the academics participating on the panel at DATE: “The professors said [Mead-Conway meant] for the first time the people who designed circuits had to interact directly with the computer scientists that were looking at the algorithms, people who were designing the data path to the computer. Antun continued, “Third, from the point of view of training designers, doing significant class projects and having chips brought back after manufacturing to be tested [by the students] had a huge impact in universities. And everyone benefited, because [teaching Mead-Conway] produced the generation of designers who have been working in the industry for the past 30 years. “Also, Jan Rabaey said that interestingly there were even chapters in the book, although people don’t quote them too much, that described the concept of timing in computing in a more abstract way, something that was being treated that way for the very first time. Jan emphasized that those ideas were additional important and unique contributions of the Mead-Conway revolution. “And there was a fourth thing mentioned in Grenoble, something that was clearly inspired by the book, but not stated explicitly there. That was the use of those formulas and interfaces that provided the beginnings of the EDA industry. Our conversation was not complete, however. I asked Antun if panelists in Grenoble had also identified opportunities that had been missed in the implementation of the Mead-Conway methods, things that might have been, but were not. I asked this because the conference catalog, prior to DATE, had promised such reality checks would be part of the panel discussion in Grenoble. Antun chuckled, “Well, of course it’s easy to see 30 years later what was missed. For example, CMOS. Most of the book is about NMOS. It’s now understood, as people looked more closely at the system, that semiconductors were not the main focus of the book. However, MOSIS was offering CMOS by 1983, so there was a little bit of [lost time] but perhaps not much. “Also, at Berkeley a lot of the emphasis was put on automation, logic or layout or compact automation. But there was very little pointing out of the importance of optimization for logic synthesis. And I don’t mean so much from one level to another, because that concept was well understood and permeated the book, but algorithms to really minimize the logic, or routing algorithms to significantly compact the layout. That was not seen at the time as critical for success for designs going forward. “Instead, there was more of an emphasis on an overall systems approach, on completing the design. Particularly for the EDA industry, however, the tools that ended up winning were the ones with better optimizations, whether it was better synthesis or better place-and-route. The importance of optimization was a piece that was not foreseen at the time. “Additionally, my observation was that a lot of the actual ability to design chips by a much larger community of people had to do with gate arrays, and very quickly with standard cells. Whereas the approach, the views in Mead-Conway were much more about what I would call custom generation. If you remember in the early 80s, there was a lot of emphasis on silicon simulation. “But the approach that won was the simplified one, initially gate arrays, but they were substituted fairly quickly with standard cells. That part was not predicted. It was missed that the industry would perhaps go to restricting the freedom [of design]. Of course, Alberto noted in Grenoble that restricting your methodology is restricting you freedom in a certain way. “So these were the things, more or less, that were ‘missed’ in the Mead-Conway Revolution if you insist on grading the crystal ball [that people had at the time]. These are the things that perhaps could have been foreseen, but were not. Antun ended with a reminiscence: “Mead-Conway was the first book on circuit design I was able to read. I was a mathematician and had tried to read circuit books before that time, but they would consist of 200 pages full of all of the characteristics of one transistor. I wanted to know when those books would get to discussing the data path, but they never got there, so in a sense the Mead-Conway book was really something! Antun said the panel in Grenoble ended with an extremely animated Q&A discussion between the panelists and the enormous audience in the room. One professor in attendance asked about the disconnect between what technologies can be taught in the universities today, and what can actually be fabricated from student designs. CMP’s Bernard Courtois acknowledged the dilemma and agreed that the increasing cost of masks is indeed creating problems. 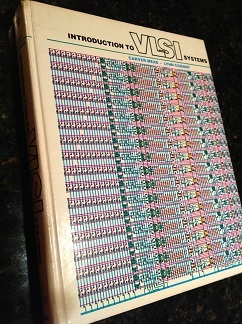 Perhaps again, something that could not have been predicted in 1980 at the Dawn of the VLSI Revolution? This entry was posted on Wednesday, May 15th, 2013 at 8:35 pm. You can follow any responses to this entry through the RSS 2.0 feed. You can leave a response, or trackback from your own site.